Born March 7, 1951, in St. Stephen, New Brunswick, David attended the community's public schools before going to Sackville's Mount Allison University where he completed an Honours BA (English). Even before graduating in 1974, David was employed by Appleby College, a private school in Oakville, Ontario, where he's taught ever since. "Then, independent schools could basically hire anybody off the street they wanted. You didn't have to have a teaching degree. Appleby flew me to Oakville, and I really liked the school. Five days after I got back, the job offer came. That was in January, and I was graduating in May. To know I had a job was wonderful. Over the years, I've thought, 'Should I get a B.Ed. or teaching license?' but all my energies have gone into my creative issues." "A couple of years ago, the school nominated me for a Prime Minister's Teaching Award. That was wonderful until I read the fine print: 'Must hold a teaching license.' Appleby's Headmaster suggested I write, telling them I'd taught for 25 years. 'Obviously you can teach,' he said. I sent the note, and they replied, 'That's just fine.' Having gotten the award, I'm assuming that, if the Prime Minister says I can teach, then I can teach." David ascribes his becoming a writer to two sources, one being a teacher. "When I was in Mrs. Orchard's grade 5 class, I sat in front of her desk. She had oodles of pens, and, because I guess she understood that I liked them, I had gratis use of them. I became so fascinated with pens and handwriting I taught myself calligraphy. So, from pens to writing to wanting to teach was the flow. In grade 6, I knew I would teach and I would write, and essentially that's just what I aimed myself towards." Family was the other major influence. "My father was blinded in a car accident when I was six, and I got interested in words and writing through him. A very creative guy, he wrote music for 'Don Messer's Jubilee.' He was involved in politics right up into the provincial level, and it fell to me to read everything that came in the mail. So, when he was putting together the Charlotte Country Progressive Conservative Association's constitution, I'd be reading Bourinot's and Robert's Rules of Order. That's where I learned sentence structure and how to type. He also 'read' by listening to novels from the CNIB's 'Great Books for the Blind,'and I'd be in the house and would hear many pieces of books that way. I can still hear Alexander Scourbie's voice in my head today." "My mother was a prodigious reader, and there were always books in the house. Because there was no bookstore in St. Stephen, when I was 12 and had a paper route, I wrote to the Harbour Book Store in St. John, New Brunswick, asking if I could set up an account to buy books through the mail. I still have all of them. In fact, I have every book I've read. I don't read a book unless I own it. I don't know how many books are in the house, but they're everywhere. I'm always in a bookstore to see if I can find that 'golden' thing that I didn't know was there." David continues to be an avid reader. "For me, if I don't read and I don't read regularly, I get frantic. Reading is stress relief. I had Dorothy Dunnett's Gemini mailed from Scotland because it's just come out. It's the eighth and last book in the 'House of Niccolo' series. After waiting two and a half years for Dorothy to finish that book, I was through it in three days. Readers commune with a book, and some kids find that again and some don't. I wish they all would because reading is absolutely just about the best thing that you can do for yourself (other than taking your vitamins and running track or something like that). It's food for the mind." In high school, the power of the printed word took on new meaning for David. "After my being school president in grade 11, some friends and I started an underground newspaper in grade 12 that almost got us kicked out. Reproduced on a Gestetner machine, it was filled with Bob Dylan quotes and drawings of two grasshoppers copulating. In university, I was the editor of the weekly newspaper, Argosy." David says that if hadn't become a teacher/writer, then perhaps we'd have come to know him for another interest. "In high school, I used to be in a rock band, and, quite frankly, if I hadn't followed the route I have, I could have been quite happy living as the Canadian version of Joe Cocker. I love Joe Cocker." "I've always had this fascination with newspapers and media, and I've been able to do that kind of thing at Appleby, both electronically and with websites. I run the school's Intranet for them, and I build a lot of websites. I have the two sides of me. One is current in terms of technology and wants to do a lot of website stuff, and the other is the side that produces the books. I write a lot of articles for things like Apple Computer and the Master Teacher, and it's actually created a problem because, besides taking so much time, it just leads to more which takes time away from writing books." "When I take my summer vacation, it's already chockablock. I actually have to work out how many days I'll spend on each thing. So book projects have been slow. For example, during this summer, I'm working on three things, all at various stages. One's a screen play with a guy in New York which we're literally writing back and forth over the internet. About a three year project, we're six months in, but the first treatment's done. I've got about four days scheduled for Closer to Hamlet, the last of the YA series. That's been a project probably closer to my heart than anything I've written of these YA books, Looking for a Hero and Bottom Drawer." "It's been five years since Bottom Drawer came out, and it's been a deliberate five years. I could've finished this book two or three years ago, but, each time I go back to it, it's actually going in a better direction. Last Christmas, I threw out half of the book and went back at it again. Not only is it the end of the trilogy, but it follows Bottom Drawer which was nominated for the Governor General's Award. I have this awful feeling that this next one better be really, really good, and I can only do that if I've got enough time to go back to it and be absolutely comfortable. I've got to 'load' it all back in my head again and then pick up and carry on from there." Originally called "Closer to Hamnet," the manuscript experienced a title change during David's Christmas discard period. "I'd actually constructed a wonderful thing with Shakespeare's son who died at the age of 10 of cholera, but that's not going to appear in the book. I argued with myself between 'Hamnet' and 'Hamlet' because they're actually two completely different storylines, and I went with Hamlet. The Hamnet part of the storyline seemed so forced to me that, in the end, it was like a kingsized carbuncle that had to be lanced. So, out it went and in came the second scenario, Hamlet, and that works beautifully (or I think it does)." The three YA titles do not follow the typical linear narrative model found in most novels for adolescents. "All three are constructed as psychological puzzles so that readers have to take the information as it comes and keep remembering a fact here, an intimation there, and another little revelation somewhere else. If they keep constructing the puzzle, in the end it all comes out." Part of the puzzle device is David's use of such writing forms as e-mails, faxes and reports. He explains, "I use things like the e-mail notes and the online stuff as a way of getting critical pieces of information in at critical times or as a way of providing a 'period' to a question raised in the beginning of the book. The narrative pieces are to enhance the characters, perhaps by giving a couple of indications as to what happened in their childhood that might reflect on their present circumstances. I try to make it so that the reader is thinking, 'I wonder if that's the reason?' without stating it." "For instance, in Looking for Hero, there's an incident involving Nicholas and his older brother where the brother holds Nicholas over the edge of the railing of the bridge over the creek. That section is not so much about the brother's holding Nicholas over the railing as it is to indicate that, from the very earliest time, the brothers' relationship is actually power based. I think narrative is a better way to do that than reporting something had happened. I'm always telling my students that, at its most basic level, writing is 'show and tell,' and you can't have just one or the other. You've have to have a good mix, and you have to think about how you want to give the information to the person that's reading. Sometimes it's better just to tell them what happened; sometimes it's better to draw them in and make them part of the scene so that the impact you're trying to deliver is much more profound." Looking for Hero had its genesis while David was stuck in traffic. "I wrote about five sentences down on the inside flap of a pack of Player's cigarettes. When I got home, I got on the computer and outlined it in thirty minutes. Then I let it sit for two days. There's a gestation period with me for anything that I write, and that gestation period can be a week or two or, in the case of the novel I've just finished for adults, as much as a year. It involves walking Milo the Wonderdog around the grounds of Appleby, usually in the evening, and thinking it through. Once it's through in my head, and I'm absolutely sure that it's workable and tight and it's what I want to do, then I'll write an outline that might be two pages long. When I'm sure that that's it, (and you just have this feeling that it's ready to start), then I'll clear the decks and down I go. After the first day, I may have produced two or three pages. I'll rework those pages the next day and maybe even the day after that until it's exactly the way that I want to go in terms of the tone, the style and so forth." "Once it fits, I just carry on. Looking for a Hero was written in five or six days. It just came out 'boom,' and had perhaps two rewrites and one restructuring towards the end where, to begin with, the ending happened too quickly. Bottom Drawer, also written in about six days, had two minor changes and amazingly went to press almost literally the way it went down on paper. I've never had that happen before, and it certainly hasn't happened with the third one. "Bottom Drawer came out of a discussion with a Grade Eleven Media Arts class. The views which they expressed about hot teen issues, such as being gay, ran the gamut. Some kids were absolutely horrified, and others were completely open and accepting. Of course, what we're trying to say in schools is essentially that the class is made up of one of just about everything you can think of. They may not know that yet, but in time when they look back, they'll find it to be true. In Bottom Drawer, I decided to approach the problem from the point-of-view of the character who wasn't gay instead of the one who was. That was the key, I think." "What's driving my final novel in this YA trilogy is actually a question of self-identity. How much would you take if you were a teenager? How far could you be pushed before you did something that you knew was absolutely wrong but, at the same time, was absolutely right? In other words, a moral conundrum. In this book, Dr. Margaret Cheung becomes more whole and actually has her own conundrum and moral decision which will, in the end, parallel the boy's. The ending is just magical. It was just one of those things that comes out of the ether. It's on the screen before you know it, and you just think, 'My god!'" The YA trilogy were not David's first books and actually followed an adventure quartet, the "Wordsy and Jess" books, and a stand-alone juvenile title, Champlain Summer. The 'Wordsy and Jess' novels began because "I was tired of writing plays for junior kids. 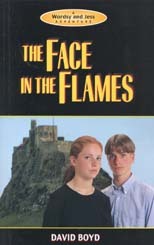 I wrote The Face in the Flames, and the three following "Wordsy and Jess" books were all written the next summer." "The Face in the Flames was written by hand in a cottage in Holystone in Northumbria in 1989. It's located about 45 minutes away from Lindisfarne, a place I've been to numerous times both before and after the book was written. I'm a big fan of historical fiction. It's all I read, and yet I don't really want to write kind of thing. With the "Wordsy and Jess' stuff, the aim was very simple. I wanted to produce a book which gave me exactly the same feeling I had as a kid reading things like 'Tom Swift' under the covers. At the end of each chapter, there was this hanging thing that produced that - I can't stop now - feeling of panic. When I came back to Canada, I sent the manuscript of Face... to a friend, Maggie Goh, who published educational books, asking, 'Would you read this and tell me if it is worth sending to a publisher?' Maggie gave it to her daughter to read, and then she read it herself and called me up at 10 o'clock one night and said, 'I want to publish this.' And that's it. It just went from there." "The next three books in the 'Wordsy and Jess' series were all written in the space of two months in the following summer using a Macintosh. I wasn't sure I could actually write using a computer, and Spellbound was the first that I tried on the computer. In that one, I think my sense of humour was more towards the front than I necessarily wanted it to be, but there has to be a certain amount of lightheartedness because humour's so much a part of kids' lives that having them involved only in serious things like kidnappings with no humour or levity just doesn't sound real to me." The rationale behind the age of David's central characters is quite simple. "With Wordsy and Jess, that's what I was teaching at the time, grades 6, 7 and 8 . I didn't write YA until I moved into the senior grades, 9 through 12. As my teaching audience shifted, so did the books." The adventure series books have been reissued with new covers. "Although I liked the original art, I thought, 'Wouldn't it be nice if you're looking at a real kid?" And so we went looking for a 'Wordsy' and 'Jess' and found them both at Appleby. Right hair colour, the whole thing. Initially, we couldn't find 'Jess,' but that was because she was sick at home. The photo covers make that leap into something more contemporary." Serendipity linked another cover to Appleby. 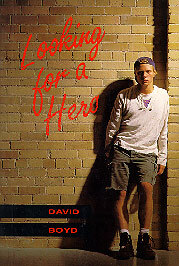 "With Looking for a Hero, they hired a model, shot it in Toronto, brought it back and showed me the cover. I looked at the kid and said, 'That's Joe Keenan. I taught him at Appleby when he was in grade five.'" As noted earlier, David does a lot of travelling during the summer. "At last count, I've seen about 150 castles, palaces, cathedrals, priories, abbeys, great houses in England, Scotland and Wales. Having been all over to satisfy my lust for historical fiction kind of thing, I have all this 'stuff' stored up here, and it may come out some day in some form or another for either children or young adults, but more likely the former. I've done the first in what might be a children's time travel series called 'The Adventures of Milo the Wonderdog.' The manuscript of the first one, 'Launching Leonardo,' is done, and it's been with Scholastic since May. The other three have all been fleshed out, and I'm ready to start writing them. Since that time though, I've come up with a different series called 'Worldwide Wonderdogs.' Again, it's connected with historical fiction in a way, but it has a cast of about eight dogs. Now it's, 'Which one do I go with?' Scholastic is aware of these other titles, and so, if they take 'Launching Leonardo,' then I'll most likely do those four and put 'Wonderdogs' on hold." The impetus for Champlain Summer, David's other published juvenile novel, actually came from his mother. "I was looking for a one-off. My mother said, 'Why don't you write a book about St. Stephen? And so I did. A lot of what appears in my books has an Appleby reference somewhere in it although most people won't get it. For instance, I had a kid once tell me that the best milkshake you could have would be a cheese one, and that appears in Champlain Summer." The book is unusual in that it has an unfaithful spouse, the children's stepmother. The choice was deliberate, and David says the difficulty was in not stereotyping her as "the wicked stepmother. For me, the ancillary characters are always right on the verge of being stereotypical. I'll try and give them enough scenes so that readers can carve something out of them, but the focus is always on the protagonist. With children's books, to give these ancillary characters any kind of 3-D means the book must get longer and involve more explanation, things which kids don't want." 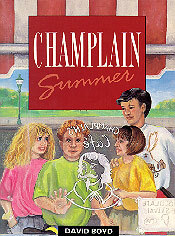 Champlain Summer was one of the earlier Canadian children's books to include non-Caucasian characters. "That came from the fact that, long after I'd left St. Stephen, on the odd occasion my mother would send the local paper, the St. Croix Courier. From it, I learned that some church organizations in town were taking Vietnamese ex-patriots into the community and were helping them set up and live their lives. This had been taking place over five or so six years, and, when there was an article about graduation, some of the kids winning awards had Vietnamese names. I don't think there was a person of colour living in St. Stephen the entire time I grew up there. I found it fascinating that my home town now had a Vietnamese-Canadian community, and that was parceled with the fact that, living up here in Ontario, you do know that racism in Canada is very subtle." "Champlain Summer's presently at Vangard Films in LA. They're looking at it as a possible movie for TV. It's got so much to recommend it as a location shoot because it's set in St. Stephen, and they do have this chocolate festival. The crowds are virtually built in, and then there's the tax credits." Looking ahead, David says, "I'll be 50 in March, 2001, and I'm looking to teaching for five more years. Then, at 55, I really want to be able to unplug the school end of things as much as possible and continue the work I do on the internet and the web while also giving myself the time I really need to pursue writing to any kind of degree. Because of the population, writers in Canada who write for children or young adults are reduced to such a tiny buying segment of the population that I don't know anybody who can survive writing in those genres without having a full time job. You're either being supported somehow or are prepared to live as a pauper. Every Canadian writer's secret dream has got to be: 'Penetrate the US market.' If you hit there, then you will have the time to write. So, do you then investigate the US market and find out what sells and write to fit and achieve popularity and money and all the rest of it? Or do you write what you know you can write, or what you feel compelled to write, and then see what happens?" "I'm satisfied with what I have at the moment though I do have an agent in the States now, and we'll see what happens. But to have the time to be able to write at length and to take on projects that I can actually see an end to and not have to give something up, well, that will be nice when it comes. In the meantime, I do it as a catch-as-catch-can kind of thing. I won't start until another YA series unless I'm absolutely certain I can produce a book a year, something I can't do that at the moment. I can only write during breaks. For me, it's a sense of, 'Once I start it, I have to do the whole thing.' I usually set aside a minimum of three-four weeks, and, if it isn't finished then, there's a problem because it might be months until I come back to it. That means that the first thing that I have to do is to 'load' it all into my head again. That's a problem because, as I'm doing this 'reloading,' I'm rewriting. For example, I've written two novels for adults, each about 50,000-60,000 words. The first I consider just to be test case; the second is now with my agent in Boston. The problem with those was it took such a long time to do them, and there were breaks in my writing time. I'd set aside three weeks, reload them 'upstairs,' and then would wind up only rewriting what I'd written three months before. That went on for some time, and so I know that my greatest enemy is time. Appleby takes so much of that time there isn't really enough to do anything in terms of length." "I was a Housemaster for about 15 years, and that's full time stuff. I didn't write any books while I was in residence. I wrote plays instead. You can only be a Housemaster for so long, and then you burn out. Then I had a wonderful cottage on the furthest end of Appleby's grounds with complete peace and quiet, and that's where I was able to do a lot of my writing. To celebrate my 25th year, I decided to buy a house and move off campus. I'm really glad I did though I'm eternally grateful for what living on campus at Appleby taught me about children as 'students' and children as 'human beings'." "The plays I actually wrote for the junior school and had the advantage of being able to cast and put them on stage, but I don't go back and visit any of them. I love Shakespeare, and I'd love to teach him because, for me, Shakespeare, is absolutely first class stuff and always will be. I did a production of Macbeth called 'The Multimedia Event' where we set Macbeth in a fascist regime and used a very minimalist stage and a huge technology component. Because we used live roving cameras and huge video screens, it allowed the stage production to have a much more intimate experience with the visual faces of the actual characters. We had a brilliant cast. I've got another 'technology' production planned for Julius Caesar set in the late 60's into the 70's in Los Angeles. It's got newscasters, three video screens and roving cameras. When Brutus delivers his speech, it's been prerecorded in the newsroom. It'll cost about $32,000, but I think we can actually pull it off . However, it's a question of when can I do it because it takes 16 months from start to finish to do, and I'm not ready yet. What will do it will be the day I walk into a classroom or classrooms and see the five core kids that I need, and, if they're there, I'm sure it will happen." David has done one adult book, a biography. "On the Lines came about because there was an Appleby faculty member who was dating Ron Finn, and I was introduced to him at a party. I'm a dyed-in-the-wool Canadian hockey fan, and so I was impressed to meet Ron. He knows everybody in hockey and, at the time, was in the latter years of his career. Eventually, we got around to the idea of doing a book. I mentioned it to Maggie at Rubicon, and she liked the idea. For a week, I interviewed Ron on my back porch. He came in each day, and I had a set of questions for him. We had the transcripts typed, and, after that, it was a matter of structuring it." 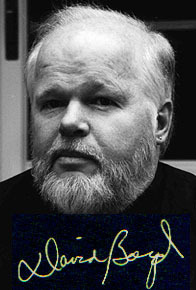 In writing novels, David says each "starts with an incident actually. To be honest, it almost starts with the climax, and inside the climax is what I want to say. It isn't necessarily a thematic thing although it will ultimately have to have that in it. I start with the event and then think, "How did it get there?' In a way, I'm sort of backtracking. Once I have the characters, then I have to stop and give them names. The nomenclature takes forever because I have this advanced sense of twee. If the name sounds twee, then I have to get rid of it and get something else. Consequently, I have a hard time getting characters' names. I'll use telephone books, history books, place names, absolutely anything until the names sound comfortable to me. Once I have that, then I'm pretty much able to go forth and beat the thing into submission." "When I'm writing, I tend to work in three hour bursts, sometimes several times a day. It's largely an 'eye' thing because I spend so much time in front of a computer monitor that, over the years, I've become very careful as to how long I actually have my eyes sitting in front of the screen. It's also that three hours is enough. Then I'll go off and do something else for a few hours. If I'm really cooking, I'll come back and go at it again or maybe later at night. I used to write well into the early hours of the morning but not any more. It's now reversed. I'll get up very early and write then. My freshest time is anywhere between 7 and 11 a.m., and sometimes that'll be it for the whole day. It depends on what I'm doing. At most, I can get six pages out in that time. Usually it's about three, and, of course, the first thing I'll do the next morning, or sometimes in the evening, is go back and edit. When I get to the end of a book, it's been edited and edited all the way along because I can advance unless I'm very comfortable with where things are. The idea of going back and editing all the way through from the beginning, that I can't do." Down the road are some 32 page poetry picture books related to sports, with hockey being the first title. "It's fun stuff with great illustrations that's primarily meant for parents who want to read poems to their kids. A lot of the poems are humorous, even silly, but some are poignant. It's just basic iambic pentameter stuff that rhymes, but the topics are things that every parent will remember from when they were a child and hopefully will want to read to their own kids, aged 5-7. Seven-year-olds will probably be capable of reading a lot of it themselves. The poems are about topics I remember as being really important to me when I was a kid. I'd put on my Montreal Canadiens sweater, and Jeff McLeod would put on his Toronto Maple Leaf sweater. We'd play road hockey or go out on the pond in the back field for hours and then come home when it was dark, completely frozen. I have a set of football poems that are ready to be illustrated as well. Kathy Douglas, an art teacher in Boston, did the art work. It's great, simple but vivid. The colours are very bright and mesh very well with the poetry." "Because I don't want the hockey book to go as a one-off, my agent in Boston is attempting to sell them as a series. We have it planned out for 14 different sports. Naturally publishers will say, and have said, 'If the first one sells really well, of course we'll want more.' And I'm saying, 'No, because, if you buy five, you'll actually market them because you've got five to sell and you'll actually push these books rather than dumping them out there with the other 15 you've published to see which one floats and which one doesn't.'" David adds, "When the last of the YA comes out, I think we will try to move them into the U.S. as a complete trilogy. I'm prepared for the hurry-up-and-wait, but I also believe in serendipity." Asked what's next, David responds, "I don't know. I will probably write YA again in a new series, probably in the same, well I can't say in the same format because whatever comes, comes. I like that kind of fractured bizarre way the information is delivered and the idea of readers collecting information as they go along, putting the puzzle together at the end and having the last piece slide in with an "ahhh' kind of feeling. I don't know what I'll do next. To be honest, I'll probably wind up just building websites until I retire and then write myself silly." Bottom Drawer. Rubicon, 1996. Grades 5-9. Champlain Summer. (A Wordsy and Jess Adventure). Rubicon, 1993. Grades 4-7. Closer to Hamlet. Rubicon, forthcoming 2001. Grades 5-9. Earthwatch. (A Wordsy and Jess Adventure). Rubicon, 1990. Grades 4-7. The Danger Beneath. (A Wordsy and Jess Adventure). Rubicon, 1990. Grades 4-7. The Face in the Flames. (A Wordsy and Jess Adventure). Rubicon, 1989. Grades 4-7. Looking for a Hero. Rubicon, 1993. Grades 5-9. 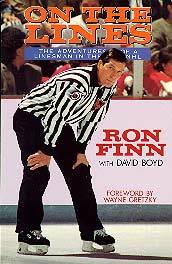 On the Lines: The Adventures of a Linesman in the NHL. With Ron Finn. Rubicon, 1993. Grades 9 and up. Spellbound. (A Wordsy and Jess Adventure). Rubicon, 1990. Grades 4-7. This article is based on an interview conducted in Oakville, ON, June 18, 2000.